Solo release from 1995 by the great accordion player from Donegal who now plays with Altan. Byrne's smooth virtuosity on the button box, crisp ornamentation and melodic invention are all in full display here. This may remind some of Sharon Shannon's first release--the two players have similar technique and the accompaniments are in the same contemporary vein. 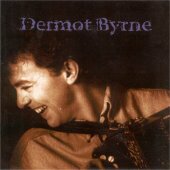 However, Byrne plays mostly Irish tunes here, with the notable exception of the Latin tune "Tico Tico" on the last track.